For some time, I’ve been enjoying Sam Alden‘s work, as well as releases from the publisher Youth in Decline so it’s rather convenient that my favourite issue of YiD’s Frontier brought these two interests together. 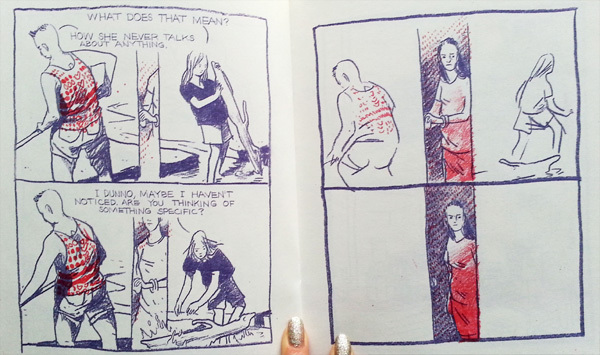 Frontier is a small zine-like series in which each issue showcases one illustrator or cartoonist. Alden’s issue features “deleted scenes” from an upcoming work, Hollow, which appears to be about two siblings struggling with the psychological dread borne of a fraught relationship with their mother. 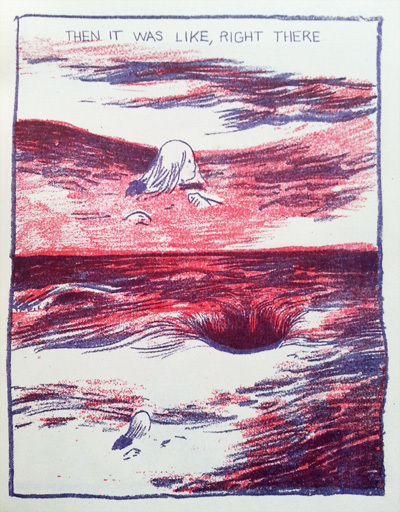 This dread manifests itself as “The Hollow,” a destructive sinkhole that stalks the siblings, unexpectedly surfacing and disappearing, as psychological trauma often does. And as is often the case with family trauma and dysfunction, nothing is made explicit; narrative details concerning the siblings’ mother or how “real” The Hollow is, remain occluded to the reader, tinging the story with an uncertainty, a threatening tone. I love this sequence in which the mother’s presence emerges unbidden, like the Hollow, interrupting the siblings’ discussion of her, dividing, silencing, and perhaps obliterating them. I’ve enjoyed Alden’s work because no matter what style he works in, he is always able to communicate very clearly through his images. I love how the simple, gestural images in Frontier #5 are able to convey a surprizing depth in mood and expression. 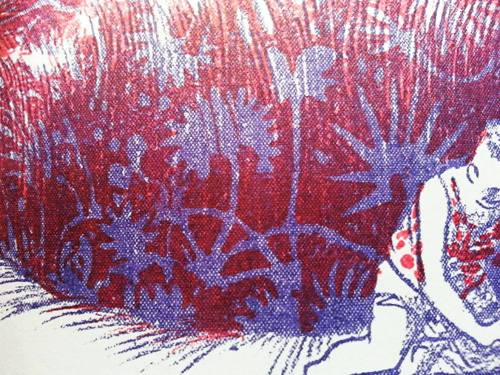 For readers familiar with Alden’s It Never Happened Again, Frontier #5 is rendered in a similar stylistic vein with the same two panel per page pacing as INHA, but Frontier’s two toned riso-print allows for more visual play, such as when we see the floral print of the mother’s sofa superimposed onto The Hollow. If these little teasers from Hollow are any indication, they promise a work of greater narrative sophistication and depth from Alden than the previous works I’ve read. 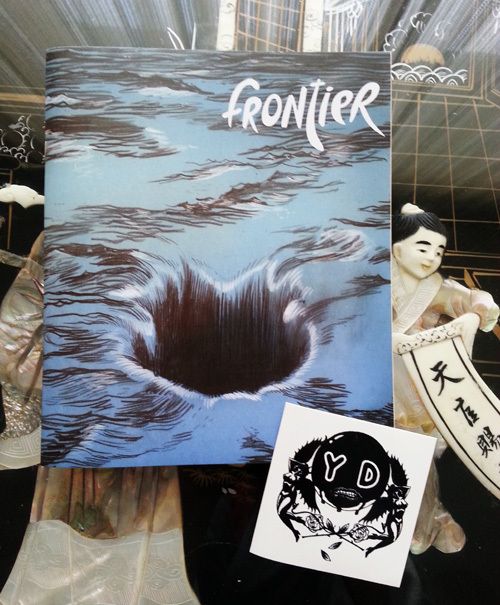 I received my copy of Frontier #5 as a subscriber. Currently, YiD is running another subscription drive for the next four issues of Frontier and is offering a digital package. Check it out! Tags: sam alden, youth in decline. Bookmark the permalink.